We were in the Halloween spirit at our Nature & Ghost Walk on October 14 with tales of extortion, poison theft, witches, arrests, a fire, and multiple ghosts… who knew that Glen Providence Park’s history was so illustrious? Marcia and I had fun sharing what we have learned about the park’s strange past, poisonous plants and dangerous creatures- all on a gorgeous October afternoon! We talked about the darker side of plants including Black walnut trees, Skunk Cabbage, and invasives English ivy and Multi-flora rose. Then there is the stunning potency of Poison ivy: while it is a nutritious food source for birds, it is said that it would take only 1/4 ounce of its urushiol oil to cause a rash in every human on earth! Perhaps the most notorious is the abundant native flower White Snakeroot– when it is consumed by cattle, the meat and milk become contaminated with the toxin tremetol. During the early 19th century, thousands of European Americans, who were unfamiliar with snakeroot, were killed by “milk sickness”– including Abraham Lincoln’s mother! Some of the park’s residents have a dark side, too- the Northern Water Snake is not venomous, but it is said to strike repeatedly when cornered, and its saliva has anticoagulent to ensure profuse bleeding! And that Great Horned Owl we were so lucky to photograph last January? We learned shortly afterwards that if threatened, it will attack- instinctively going for the head or face. An able predator, the Great Horned Owl eats prey as large as Canada Geese and Great Blue Herons! We recounted those tales from before the park was created, when it was called Scroggie Valley– including the 1700’s Ghost Story and 1800’s Witch Story. We told the stories at their appropriate locations in the park, with some extra details we have learned. We connected the park with other local tales from long ago– and amazingly it turned out that one of the historical figures we mentioned had a descendant in our group! We also shared strange events that happened since the park was created, including a stolen poison bottle, and arrests of humans and ducks alike! You can always read the annotated ghost and witch stories on our website, and read about the stolen poison bottle on facebook. But if you want the extra details and stories we shared on our walk, you’ll just have to join us next October! Thank you to the (at least) 21 adults and boys (and one of our favorite beguiling dogs) who joined us on our Nature & Ghost Walk! No pictures this time, we were too busy juggling our notes! 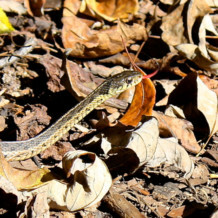 The snake shown is a harmless Common Garter Snake that we spotted while planning our Nature & Ghost Walk.